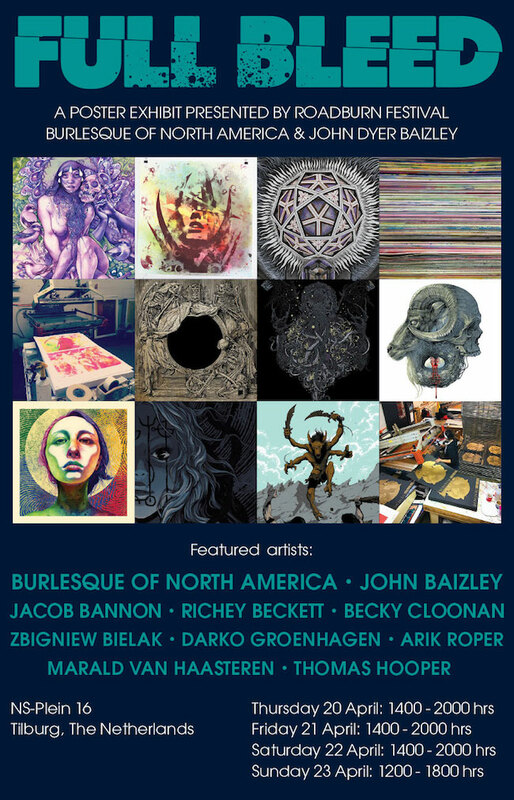 Roadburn Festival is proud to be teaming up with Burlesque of North America (BRLSQ), and our 2017 curator, John Dyer Baizley to bring festival attendees “Full Bleed”, an exhibition of silkscreened poster art. The title of the exhibition refers to a common screen printing term, describing a process where silkscreen ink is printed beyond the cut edge of a poster. As a festival that prides itself on taking music and art beyond the expected border, we knew we had to bring this exhibition to Roadburn 2017. BRLSQ is a creative studio and screen printing shop based in Minneapolis, USA, with only five full-time staff, but an immense vision. The roster of artists they collaborate with is rich and diverse, and John Dyer Baizley has been with them for over a decade. Full Bleed is an exhibition of printed artwork, along with a print sale featuring artists and collaborators connected through the community of heavy music, artistic comraderie, and a shared print shop: BRLSQ of NA. The exhibition will be open every afternoon / evening throughout Roadburn and a full list of the artists involved can be found below. Known throughout the Roadburn community as the front man for Baroness, and indeed as our 2017 curator, John Dyer Baizley is an accomplished fine artist responsible for nearly all the artwork surrounding Baroness, and has created a host of artwork for other bands too. In addition to his music-related artwork, John has a long-standing relationship with Burlesque of North America, with whom John has created thousands of art-prints. Strongly influenced by symbolism from the 19th–century along with an encyclopedic knowledge of primitive mysticism, global mythologies, pagan rites and Jungian archetypes, Baizley arrives at a very different place with his imagery than typically expected. While still embracing the seminal teenage icons like Pushead and Raymond Pettibon, and borrowing from collective narratives that predate modern art, Baizley has created an alternative dialect of imagery with his work, taking the viewer on a familiar, yet unique path. Baizley’s artwork recalls the style of late 19th-century Art Nouveau and of 1980’s punk rock, but re-contextualizes it in a more personal, claustrophobic setting. By overloading traditional symbolism and metaphor with dissimilar stories, archetypes and references, stylistic tropes and lighthearted line work become a denser thing entirely, a story which is nearly unrecognizable when seen as a sum of its parts. In an effort to bring as much of Baizley‘s curatorial taste to the festival, he and BRLSQ of NA have teamed up to offer a showcase of relevant visual artists who work within the community of musical artists invited to this years festival. Jacob Bannon left a significant imprint on the psyche of many in attendance at Roadburn 2016 when he performed two spellbinding sets with his band, Converge. This year Jake returns to Tilburg, but will be represented not only on stage, but also as part of the Full Bleed exhibition. Born in 1976, Jake grew up near Boston, Massachusetts (US). When he was 11-12 he became obsessed with the vibrant artwork of the skateboard, BMX, and metal music cultures. He started painting and drawing in a serious manner at age 13. Enrolling at Art Institute of Boston in 1994, he abandoned the “Fine Art” exclusive approach, and enrolled in the Design Program to broaden his horizons. A nontraditional musician / artist / writer, he links all of his creative outlets together, making something bigger, more complex, and creatively personal. Jake’s solo project Wear Your Wounds is performing Sat April 22 at this year’s Roadburn Festival. Working predominantly with record cover and poster art, Richey Beckett has been personally invited to create numerous works for legendary metal titans Metallica, progressive sludge behemoths Mastodon and psychedelic torchbearers the Grateful Dead. Beckett uses traditional pen and ink methods to create intricately detailed pieces of black and white illustration. Taking influence from historic biblical, literary and natural history illustrators and engravers such as Doré, Durer, Audubon and Bewick, along with the decorative flair of Art Nouveau, Beckett creates his own organic world which expands with each new piece. Clients include: Metallica, Mastodon, Grateful Dead, Kvelertak, Baroness, Trash Talk, Unearth. Becky Cloonan left her fingerprints all over Roadburn 2016 with the incredible poster artwork that adorned our merchandise, posters, flyers and even flags around the city of Tilburg! A firm favourite with the Roadburn crowd, we’re thrilled that Becky will be making a return to the festival this year. Cloonan is an award-winning cartoonist and illustrator who started self-publishing mini comics in 1999. Since then she has gone on to work with Vertigo, Dark Horse, Harper Collins and Marvel, with editions of her work published in several countries around the world. She still tries to self-publish a new mini comic every year. Bielak’s artworks have likely seeped into the record collections of many Roadburners already, whether they’re aware of it or not. Born in 1980 in Kracow, Zbigniew M. Bielak is a Polish artist and architect, known in the musical realm for his record cover illustrations, which among others include meticulously handcrafted artworks of Ghost, Watain, Mayhem or Paradise Lost albums. His detailed artworks blend historical, archaeologic and architectural inspirations, with the pursuit of historical coherence and attention to detail being clearly focal points of his varied stylistic leanings. With both grandfathers as painters, Darko grew up where there was always art present. Always with his nose in the underground comic book collection of his dad and with his mom as a hobby photographer, at an early age he knew that drawing would become his life. Through graffiti, comic style drawing, designing for a band he was in, and eventually art school, he found his love for painting and his interest for symbolism was awoken. In 1993 Darko left art school to start an apprenticeship with Greg Orie’s Dragon Tattoo. Today he runs a Oneness Tattoo shop in Tilburg and spends most of his spare time painting and drawing. For this expo he has dug into his love for Roadburn and his connection with bands such as The Devil’s Blood. Another artist whose work will be very familiar to Roadburn audiences; Arik provided the official festival artwork in 2015, and has provided his considerable talents to several bands that have passed through the Roadburn venues over the years. Roper is an illustrator who attempts to transcribe images from the visionary mental realms to paper and canvas. Over the years these images have appeared on an variety of album covers, posters, prints, books, magazines, animation, and other outlets that allow him to indulge in journeys of visual escapism. Marald van Haasteren was born in Leiden, The Netherlands in 1970. He graduated from the Royal Academy of Arts in The Hague in 1995. He has been making art for the DIY and underground music scene since 1989 ( bands he worked for include: State of Fear, Wolfbrigade, Boltthrower, Kylesa, High on Fire ). His techniques range from black and white ink work till full color paintings. He uses digital media to boost his images but the basis is always hand drawn work. Marald will also have artwork on display at the 013 venue throughout Roadburn 2017. Thomas Hooper is a tattooer, an artist, a husband, and a father. These identities shape, blend and define his artistic sensibility across multiple creative mediums. Taking creative inspiration from historic iconography, alchemical and early scientific illustrations, traditional woodcuts and mystic cosmology, Thomas has been tattooing since 2000 and is considered a leader in the modern black-work tattoo genre. Thomas studied drawing at the London Institute of Art and Design and his artwork has been displayed at numerous galleries, including a recent joint exhibit with his tattoo mentor Jim MacAirt at Fleet Gallery in his hometown of Hastings in East Sussex (UK). Thomas mixes orthodox and contrary drawing and painting techniques, organic textures, computer-enhanced patterns and geometrical entities from his everyday practice on skin in his fine art creative process. In 2014, Mediafriends / Tattoo Life Productions published Inward: The Art of Thomas Hooper featuring over 120 drawings and paintings as well as a collection of sketches, textures and illustration that document his prolific artistry. Defying creative confinement, Thomas has collaborated with companies such as Fine Light Trading, Helmet Lang and True Black to create jewelry, fabric and clothing. He has created album art and layout design for Neurosis, Converge, Tombs, Doomriders and many other musical groups. He is also the author and publisher of several highly-regarded pattern, line drawing and skull reference books. Thomas’s pictorial work may share a complementary undercurrent with his skin-based application, but it travels far from the world of tattooing to explore a very medium-orientated abstraction. Burlesque of North America is a creative studio and screen-printing shop based in Minneapolis MN. We have a relatively small in-house team: Ben Lafond and Sarah Schatz are screen-printing co-wunderkinds and ink-wizards, Wes Winship reigns supreme with creative oversight and large-scale painting, Mike Davis drinks from an bleeds design and sweats vector-art, and Jodi Milbert is the queen-bee shop manager and shipping-overlord. The full scope includes many contributors and collaborators. We are very lucky to work with an army of hyper-talented artists, all dedicated in a lifelong pursuit to perfect the printed image.